Located in a tranquil area of Nusa Due, this stylish property is just a 10-minute drive from Bali Collection shopping area and a 20-minute one from the Ngurah Rai International Airport. Guests looking for some vibrant nightlife will be a half-an-hour drive away from Kuta's downtown area, while those who are looking for some cultural sightseeing will be at half that time from Garuda Wisnu Kencana. For exploring the area around the venue the hotel can also offer bicycle rental services, but when it comes to relaxing is where it does its bests. One can spend some time on the sun loungers around the outdoor pool and perfect their tan or workout with a swim. When extra pampering is needed they can always head to the spa and wellness centre or treat themselves to an extensive massage that will invigorate both their bodies and minds. This delightful hotel boasts a strategic, central setting in Bali, as it is within easy reach from the main entertainment, dining and shopping opportunities. Although it is located in a quiet side street allowing a peaceful environment, the establishment is very close to the Sky Garden nightclub to dance the night away, the Bali Bombing Memorial to learn more about the bomb blast in 2002 or the nearby Beachwalk shopping centre. All guest rooms and suites are spacious and nicely appointed with luxurious amenities, making it possible for its visitors to enjoy a relaxing and comfortable stay. Among the on-site facilities, the hotel counts with a fantastic swimming pool with a pool lounge next to it, ideal to rest in good company. 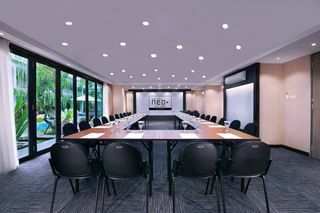 Corporate travellers may also take advantage of the meeting room available for their business meetings, as well as the complimentary Wi-Fi connection throughout. Located just a 2-minute walk from the famed nightlife along Legian Street, Hotel NEO+ Kuta Legian offers a modern and convenient accommodation with an outdoor swimming pool, free WiFi access in all areas and free on-site public parking for guests who drive. It takes a 15-minute walk from the property to the iconic Kuta Beach and around a 20-minute drive to the famed and stylish Seminyak area. Getting to Bali Denpasar International Airport will take around 15 minutes by car. Airport shuttle is available upon request and at an additional charge. Lying directly on Tanjung Benoa Beach, Sol Beach House Bali Benoa offers a luxurious beach hotel amidst spectacular surroundings. The hotel is situated a mere 2 kms from the affluent resort of Nusa Dua where guests can explore the wealth of shops and entertainment venues. For guests seeking a more cultural experience there are a host of sights to be found including many temples in the vicinity. The hotel is a mere 20 minute drive from Ngurah Rai airport.The aesthetically impressive modern architectural style, lush tropical gardens, and typical Balinese style rooms presents guests with an eclectic yet intriguing mix of the traditional and contemporary. The relaxing ambience is sustained by the array of rejuvenating relaxation treatments which guests can avail of in the hotel Spa. There are also many recreational and dining opportunities to be enjoyed. 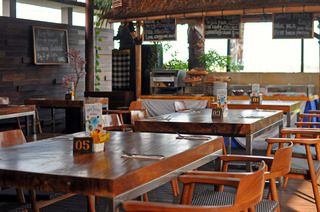 This charming hotel is located in Bali, just a few steps from Legian beach. Guests will find a choice of shopping opportunities and dining venues in the surrounding area which will make their stay even more enjoyable. Moreover, Ngurah Rai International Airport is just 11 kilometres away. The elegant guest rooms range from the comfortable Superior room to the outstanding Junior Suite, all beautifully designed and featuring practical services to guarantee guests enjoy a comfortable stay. 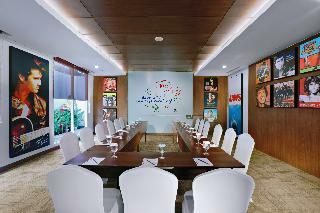 Ideal for business travellers, the property includes two meeting rooms completely equipped to host any kind event. The outdoor pool is surrounded by comfy sun loungers and the restaurant serves a delicious combination of Balinese, Asian and European delicacies. Fame Hotel Sunset Rod Bali is designed every room in the styles of the famous era of the 1980's,1990's to Y2K. From the movie posters on the walls, to the music and ambiance of the hotel corridors, all are designed to give you a unique experience of the hotel corridors, all are designed to give you a unique experince when staying at Fame Hotels. Hope it can inspire every guest though this theme, or maybe even bring some good memories back to life. 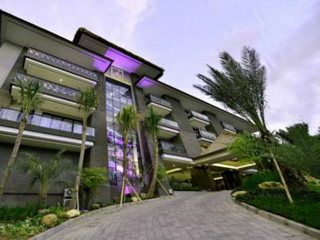 Fame Hotel Sunset Road Bali offer an attaractive combination of smart designs and lifestyle facilities. The evolution of our facilities, including POPCORN Resto, Fame Merchandise and E-corner have become valuable additions, showing how much we value our guest memories from that eras and we want to make them feel Fabolous. This 5 star hotel is located on the coastline of Bali Island and was established in 2013. 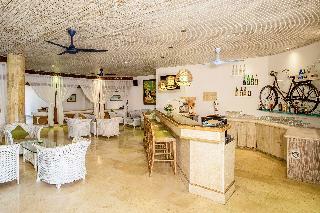 It is a short drive away from the Tanjung Benoa. The Hotel has a coffee shop, an outdoor swimming pool and a fitness centre/gym. All 81 rooms are equipped with minibar, hairdryer, safe and air conditioning. 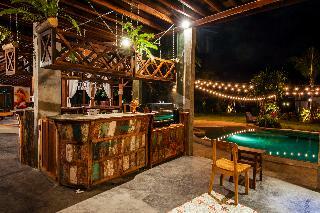 Stay at Anyar Sari Villa in Canggu, you’ll be near the beach and convenient to Berawa Beach and Seminyak Square. This villa is within close proximity of Canggu Club and Batu Belig Beach.Make yourself at home in one of the 11 air-conditioned rooms featuring private pools and flat-screen televisions. Rooms have private balconies or patios. Kitchenettes are outfitted with full-sized refrigerators/freezers. Complimentary wireless Internet access keeps you connected, and cable programming is available for your entertainment. Private bathrooms with separate bathtubs and showers feature deep soaking bathtubs and complimentary toiletries.Enjoy a meal at a restaurant or in a coffee shop/café. Or stay in and take advantage of the villa’s room service (during limited hours). Quench your thirst with your favorite drink at a bar/lounge.Featured amenities include dry cleaning/laundry services, luggage storage, and laundry facilities. A roundtrip airport shuttle is provided for a surcharge (available 24 hours), and free valet parking is available onsite. Located in the countryside in the northern part of the island, close to the rainforest and the three central lakes of Bratan, Buyan and Tamblingan. The centre of Bedugul is 7 km from the resort, Singaraja is around 50 km away and Denpasar is approximately 80 km away. Ngurah Rai International Airport is around a 2-hour drive from the resort.Designed in a modern-traditional style by award-winning Balinese architect, Popo Danes. Built in 2008, it offers facilities include a bar and restaurant, Internet access (fees apply), room service, and a laundry service (fees apply).Very spacious with tropical hardwood parquet floors and local artworks which work together to produce a warm interior and feature an en suite bathroom with shower and hand-polished Terrazzo bathtub, as well as a double bed, direct dial telephone, satellite TV, a minibar, tea and coffee making facilities, individually regulated air conditioning and a private terrace.Possibility to arrange guest activities (for a fee), such as tennis, cycling and horse riding, outdoor swimming pool.A Continental breakfast is served each morning and lunch and dinner are available from set menus.It takes two and a half hour drive from Bali International Airport to get to the hotel.